Welcome readers, writers, librarians, teachers and weather enthusiasts! My name is Jean Taft and I write books (well just one for now) for kids. 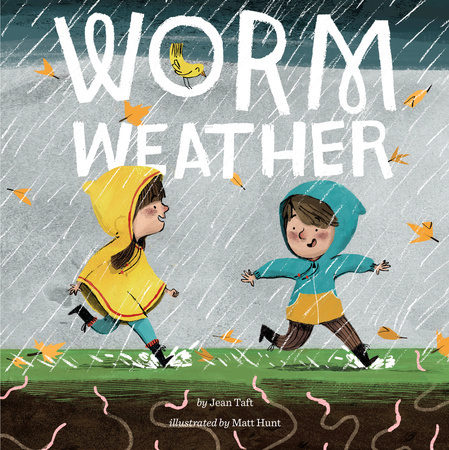 My first picture book, Worm Weather, was just released this October 2015 by Penguin Young Readers! I am a New England native and fortunately for me, I love weather! What is the best weather for reading and writing? Any weather! From snowstorms to thunderstorms, and raindrops to rainbows you will find me reading, writing or outside walking the beach or canoeing a pond. When I was growing up I always loved being outside on those rainy days when the worms were crawling around! You know, Worm Weather! My sister and I used to try and save the worms. You probably did too! I love talking with grown-ups and kids alike about this book. As soon as I mention the title, most people know exactly what type of rainy day the book is about! To learn more about me and my work, visit the menu above. March 21, 2019 5:30pm at Rogers Free Library, 525 Hope Street, Bristol, RI. Come visit Mrs. Katz and Her Hats STEM Storytime!